1. IN THE BEGINNING, THERE WAS A DIFFERENT ALICE. 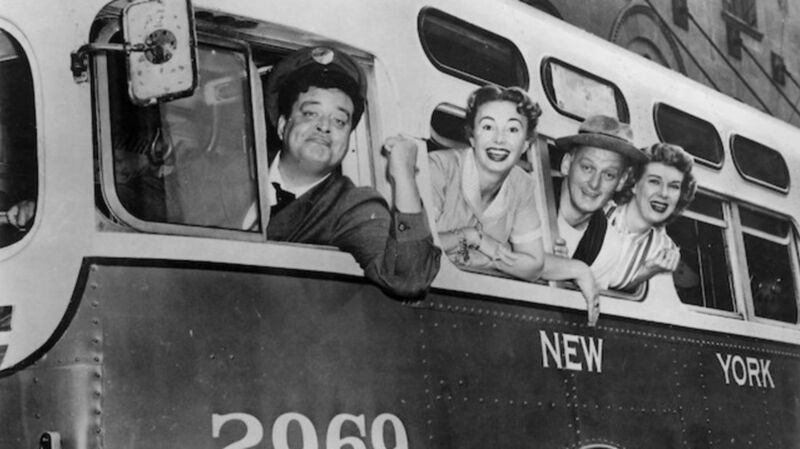 The Honeymooners began as a semi-regular sketch on Gleason’s 1951 variety series Cavalcade of Stars. Most of the same elements that appeared on the later CBS series were already in place, except that Gleason’s waistline was noticeably smaller and “Alice” was played by a different actress. Veteran vaudevillian Pert Kelton originated the role and would have remained on board had her husband, Ralph Bell, not sponsored an ad in The Daily Worker in 1948. Bell was branded a Communist and his name was published in the Red Channels pamphlet that served as an unofficial blacklist for potential employers. Kelton was guilty of fascism by association so, despite Gleason’s protests, the network terminated her while telling the viewing public that she’d left for health reasons due to a heart condition. Audrey Meadows took over the role for the CBS series. When Meadows arrived to audition for the role of Alice, Jackie Gleason immediately rejected her, reportedly stating that she was “too young and too pretty” to play his working-class wife. Meadows went home, removed her makeup, changed her hairstyle and donned a plain house dress. She hired a photographer to take some de-glamorized shots of her and messengered them to Gleason. “That’s Alice!” Gleason declared, without realizing that it was the same actress he’d rejected the previous day. 3. ONLY ONE OF THE SHOW’S STARS EARNED A LIFETIME OF RESIDUALS FROM THE SERIES. Meadows had two brothers, both of whom were attorneys. When it came time for her to sign her Honeymooners contract in 1952, they accompanied her to the bargaining table and insisted that a clause be inserted regarding residuals for any episodes that were re-broadcast. The network agreed, never imagining that the show would become every UHF station’s late-night filler fodder and that they would still be sending the actress checks 40 years later. 4. ART CARNEY’S DAD WAS THE INSPIRATION FOR MANY OF ED NORTON’S MANNERISMS. Art Carney’s Ed Norton was famous for exasperating “Ralphie boy” with the elaborate gestures and flourishes he performed before the most mundane of tasks, whether it was signing a letter or playing the piano. Carney was simply imitating his father, who couldn’t perform the simplest of tasks—like signing his son’s report card—without going through a litany of routines, like adjusting the desk lamp just so, aligning the paper, moving other items on the desk, flexing his arms, and double-checking his pen. As much as Norton’s rituals exasperating Ralph, they delighted the audience, which prompted Gleason to encourage Carney to exaggerate and prolong his obsessive-compulsive motions. 5. NORTON’S SIGNATURE HAT BELONGED TO CARNEY. The felt porkpie hat that Ed Norton wore was from Carney’s own wardrobe. He purchased the chapeau in 1935 when he was still in high school. It was the first hat he ever bought and cost him a whopping $5. In a 1985 interview with People magazine, Carney said that he still had the hat stashed in the closet of his home in Westbrook, Connecticut. 6. THE KRAMDENS’ APARTMENT WAS INTENTIONALLY DEPRESSING. Gleason designed the sparsely furnished Kramden apartment set to resemble the Chauncey Street tenement he grew up in in Bedford–Stuyvesant, Brooklyn. Theoretically the Kramdens could have outfitted their flat with a few luxuries like the Nortons did, since Ralph and Ed made the same $62 per week salary (approximately $549 in today’s dollars). But Ed bought a lot of his furnishings on credit, which Ralph was dead set against. Meadows received sacks of mail every week from concerned viewers containing decorative aprons, curtains, and knick-knacks so that she could spruce up her dreary living quarters. 7. THERE WERE NO DRESS REHEARSALS. Gleason didn’t believe in rehearsals, mainly because he preferred his performance to be fresh and spontaneous, and partially because he preferred to spend his afternoons relaxing with friends at Toots Shor’s famous Manhattan watering hole. He usually did one run-through per script, with a minimal amount of crew on hand since he also wanted the cameramen and stage hands to hear and react to the jokes for the first time on filming nights. Meadows, Carney, and Joyce Randolph preferred to go into each performance more prepared, so they would rehearse on their own with someone else reading Ralph’s lines. Gleason would occasionally forget some dialogue and would signal his distress by patting his stomach. That was a signal his co-stars (usually Carney) to ad lib enough to allow Gleason to regain his composure and continue on with the scene. Meadows also used body language—side-long glances, a jutting elbow from a hand on her hip—to discretely guide Gleason to his onstage “mark” when necessary. 8. THE SERIES HAD SOME A-LIST FANS. Cary Grant, the very definition of a dashing and debonair Hollywood leading man, made a point of approaching Meadows on the Paramount lot one afternoon during The Honeymooners’s summer hiatus. As she recalled in her 1994 autobiography, Love, Alice, Meadows was flattered to have one of filmdom’s biggest stars so anxious to meet her and was just slightly crestfallen moments later to find out it was because he was a Honeymooners fan and wanted her to talk to Jackie Gleason about allowing him do a guest spot. 9. JACKIE GLEASON BRIEFLY CONSIDERED SUING THE FLINTSTONES. While The Flintstones simply hinted at The Honeymooners, Warner Bros. was more blatant with their cartoon tribute. Their 1956 animated short was not only entitled The Honey-Mousers, but its main characters were named Ralph Krumden and Ned Morton. Somehow, Gleason got wind of the project after it was completed but before it was released to theaters and insisted on taking a look at it. 10. GLEASON CALLED IT QUITS AFTER JUST ONE SEASON. For several months after it premiered, The Honeymooners was second only to I Love Lucy in popularity and Gleason was dubbed the “king of Saturday night television.” But in the fall of 1955, rival network NBC moved its popular variety series The Perry Como Show to the 8 p.m. time slot on Saturday nights, and The Honeymooners started losing momentum. By September 1956, the show had dropped down to number 19 in the Nielsen ratings, and CBS was considering cancellation. Gleason, however, pulled the plug himself after 39 episodes, stating that the writers had exhausted all the possible plots for a half-hour sitcom and he wanted to go out on a high note, before the writing suffered. The Honeymooners would return once again as a recurring skit on The Jackie Gleason Show (1966-1970), whenever Carney was available. According to Gleason, Carney was “90 percent” responsible for the success of The Honeymooners.